PARIS — Defenceman Colton Parayko scored twice and centre Nate Mackinnon moved atop the tournament scoring leaders with three assists as defending champion Canada beat Norway 5-0 at the ice hockey world championship on Monday. Canada tops Group B with five wins from six matches, putting it three points ahead of 2010 winner Czech Republic. Canada has 27 goals for only eight conceded, with the only defeat to third-placed Switzerland. Russia is doing even better than Canada, with six straight wins after beating Latvia 5-0 to retain top spot in Group A ahead of the United States. The clinical Russians have 32 goals and allowed five ahead of their showdown with the Americans on Tuesday. Brayden Schenn, Mark Scheifele, and Ryan O’Reilly got Canada’s other goals while goaltender Chad Johnson had an easy 10-shot shutout for Canada, which is chasing a third straight title and record-equaling 27th. Russia holds that record, with 22 of those achieved as the former Soviet Union. Canada coach Jon Cooper said the players were fired up after losing to the Swiss 3-2 in overtime on Saturday. 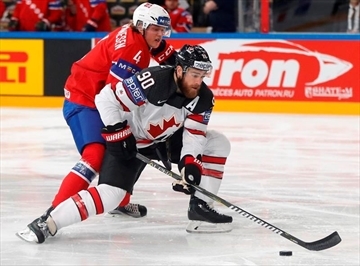 Canada’s last group game is on Tuesday against fourth-placed Finland, which is three points clear of Norway. Mackinnon has five goals and six assists so far. That puts him two behind Russian winger Artemi Panarin, who also had a hat trick of assists against Latvia. Russia’s goals came from Bogdan Kiselevich, Ivan Telegin, Vladislav Namestnikov, Nikita Kucherov and Anton Belov. Latvia is level on points with Germany and they face off on Tuesday for a quarterfinal spot. Parayko’s ability to shoot from distance gave Canada the bonus of extra firepower. Norway coach Petter Thoresen thanked his goaltender Henrik Haukeland for keeping the score down. Meanwhile, France beat last-placed Slovenia 4-1 in Group B. Forward Antoine Roussel grabbed a hat trick and 41-year-old goalie Cristobal Huet received an emotional send-off from the home crowd and players from both sides in his final international. Jan Mursak got an impressive consolation on a lightning-fast breakaway when Slovenia was short-handed. Denmark beat Italy 2-0 in Group A’s other match with late third-period goals from Nichlas Hardt and Peter Regin. Italy ended the tournament with seven straight losses and was relegated.